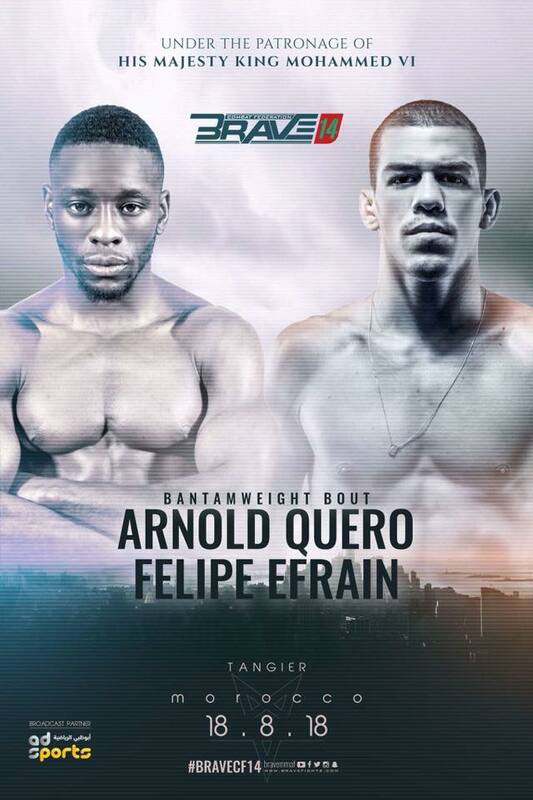 A bantamweight mixed martial arts battle between Arnold “Silverback” Quero, 30, of Paris, France and Felipe Efrain, 24, of Sao Paulo, Brazil and has been booked for “Brave 14.” The 14th Brave Combat Federation event will take place in Tangier, Morocco on August 18, 2018. “Brave 14” is the first MMA event of a global promotion to be held in Africa. It marks the fourth Brave CF bout of Efrain, who is training at Chute Boxe Academy in Curitiba, Brazil. This will also be the first time Efrain is fighting in Africa. He is coming out of a loss to Frans “The Black Mamba” Mlambo, 27, of Dublin, Ireland. On March 2, 2018, Mlambo knocked out Efrain at “Brave 10: The Kingdom Rises” in Amman, Jordan, marking the first Brave CF loss of the latter. If the Brazilian contender wins at “Brave 14,” he will improve his professional MMA record to 13 wins and 3 losses. On the other hand, Quero currently has 15 wins, 6 losses and 1 No Contest. He is coming off a victory over Caio Gregorio, 28, of Belo Horizonte, Minas Gerais, Brazil at “Brave 11,” which took place in Belo Horizonte on April 13, 2018.